In 1939, a Cardinal was National League batting champion, but it wasn’t the player who nearly hit .400. Cardinals first baseman Johnny Mize won the 1939 league batting title with a .349 mark in 153 games. At that time, a player needed to appear in 100 games in a season to qualify for the National League batting crown. 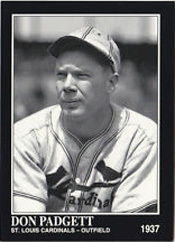 Mize’s teammate, catcher Don Padgett, hit .399 in 92 games for the 1939 Cardinals. Padgett produced 93 hits in 233 at-bats. No National League player with at least 200 at-bats in a season has had a higher batting average since then, according to baseball-reference.com. If not for bad timing, Padgett, 27, would have hit .400 that season. On Oct. 1, the last day of the 1939 season, the Cardinals played the Cubs at Chicago’s Wrigley Field. Padgett, a left-handed batter, was sent by manager Ray Blades to pinch-hit for pitcher Max Lanier against the Cubs starter, right-hander Claude Passeau. Padgett lined a single to center, according to author John Snyder in the book “Cardinals Journal,” but the hit didn’t count. First-base umpire Bick Campbell had called time out just before Passeau delivered the pitch because a ball had rolled from the bullpen onto the field. The hit in his final at-bat of the season would have given Padgett a .402 batting average. Two years later, Ted Williams of the Red Sox became the last big-league player to hit .400 in a season with at least 200 at-bats. Williams hit .406 in 1941. Padgett was used almost exclusively against right-handed pitchers in 1939. He hit .399 (89-for-223) versus right-handers and .400 against left-handers (4-for-10). He was especially productive at home, hitting .455 (46-for-101) for the 1939 Cardinals at Sportsman’s Park in St. Louis. Primarily a backup to starting catcher Mickey Owen, Padgett enjoyed a torrid June (.441 batting average) and July (.484). His batting average was .400 on Sept. 27. Then he went 1-for-3 against the Reds on Sept. 28, dropping his batting mark to .399 and setting up that final at-bat versus the Cubs three days later. In five years with the Cardinals, Padgett hit .292 in 525 games. His career mark in eight big-league seasons with the Cardinals, Phillies, Dodgers and Braves was .288.